Gotz Happy Kidz 50cm tall Emma has big brown-grey eyes, long eyelashes, long blonde hair, painted feathered eyebrows and full lips, all giving her a fresh looking look. Her body is vinyl and as well as joints at the shoulders, hips and neck, her limbs have elbow and knee joints which make her flexible for sports. Emma is safety tested for children from age 3 but My Doll Best Friend recommends her to girls age 6 and above, as her jointed vinyl body can be tricky to position for younger children. One of the consequences of having so many joints is that these dolls are not as inflexible as some other dolls therefore there is indeed a technique to posing them.The Happy Kidz body is modelled on a typical 10-11 year old girl. 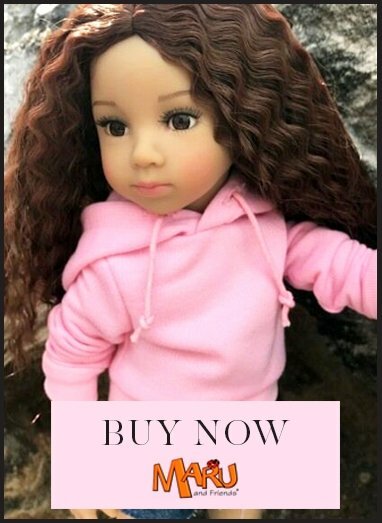 Gotz moulds are designed with a degree of asymmetry to make dolls look more real as a reflection of the fact that in reality people are not symmetrical. Gotz's high quality, real looking hair, is durable enough for washing, combing and styling. The My Doll Best Friend hairbrush is excellent for detangling without damaging the hair.